Domain nameservers (DNS) connect your website to your hosting, it is important to know how to manage them. Please note that these instructions should be followed only if your domain DNS have been changed to those of alidropship.com (for example, ns1.alidropship.com и ns2.alidropship.com). Important! Please, do not edit the existed zone records if you are not sure in what you want to do. Your DNS resource records can be added and edited in your cPanel. To do this, log in to your cPanel and go to Domains=> Zone Editor. If you have more than one domain name added in your cPanel, click Manage option for the domain name you need to add a new record for. 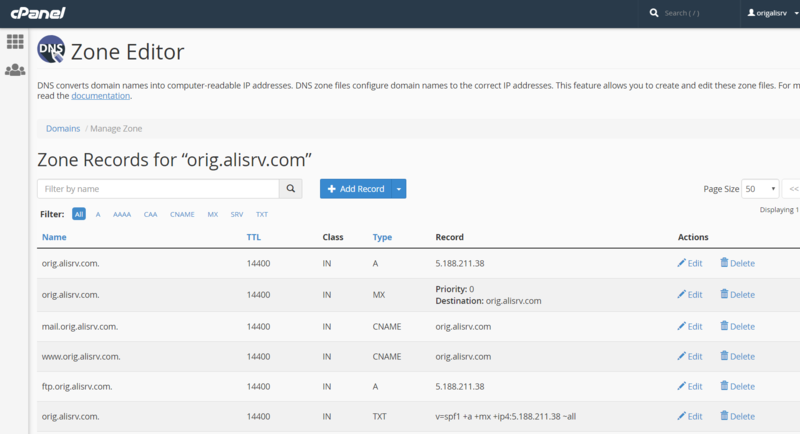 You'll see all zone records for a chosen domain name. To add new MX record (or records) you need to remove the existed MX record first to avoid records conflict. Click Add Record, choose MX type. Your domain name will be pasted automatically in Name field. You just need to paste Priority and Destination values provided by your mail service and click Add Record in Actions. If you got an error, put a period at the end of a domain name in Destination field. SPF, DKIM, DMARC records should be added as TXT records. To add new TXT record (or records) click Add Record, choose TXT type. Paste Name and Record values provided by your mail service, click Add Record in Actions. CNAME records can be managed in Zone Editor as well. Сlick Add Record, choose CNAME type. Paste Name and Record values provided by your mail service and click Add Record in Actions. It is important that you put a period at the end of your domain name in the Name field.